Olari Elts is a regular collaborator with the Scottish Chamber Orchestra, but while this gives him a warm relationship with them, it hasn’t meant that he has ended up doing things out of habit. Quite the reverse. He approached Beethoven’s Fifth Symphony as though it was being played for the first time, with sparkling energy, clear articulation and a sense of narrative drive that rendered the whole thing sort of unarguable (even though his horn section let him down more than once). There was also a molten string sound running under the brio of the first movement, which came into its own in the Andante, and he gave us a Scherzo of beautifully judged contrasts. Likewise, Brett Dean’s Testament, inspired by Beethoven’s state of mind as he wrote the Heiligenstadt Testament, felt logical and precisely articulated, from the desperate scratching of the opening through the false hope of the Razumovsky quotations and the climactic terror of the disjointed ending. If Dean was trying to evoke Beethoven’s anguished uncertainty, then his interpreters told that story with rock-solid clarity. The most interesting thing on the programme, though, was James Ledger’s arrangement of Mussorgsky’s Songs and Dances of Death. Eschewing Rimsky-Korsakov’s and Shostakovich’s orchestrations, Ledger adopts a setting for violas, cellos, basses, harp, horns and clarinets, giving a totally distinctive and utterly appropriate darkness to the sound. It’s used very intelligently, though, with skirling clarinets to evoke the snowstorm of the Troika and, in the opening Lullaby, the cellos sounding both richly alluring as the voice of death and shuddering panic at the mother’s entreaties. It also has the advantage of reducing the chance of the soloist being swamped, though there’s little danger of that when Ain Anger is your bass. Fresh from the recent run of Boris Godunov at Covent Garden, Anger has a dominant voice that filled the Queen’s Hall effortlessly. He isn’t Russian, but he has all the characteristics of the most profound Russian basses; namely cavernous authority and the narrative articulation to match. 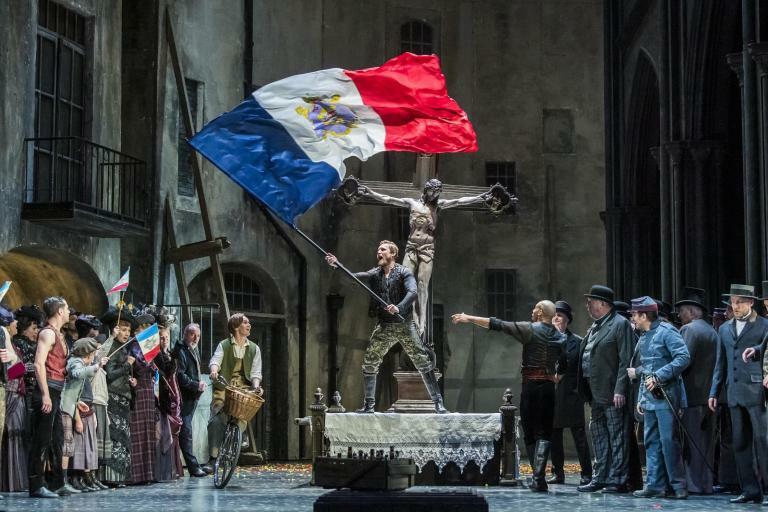 He is utterly commanding in this repertoire, not just in setting the narrative scene – showing that you don’t need an opera stage to tell a story – but especially when he spoke the words of Death himself, booming with authority when, for example, he spoke the words “You are mine!” at the end of the Serenade. His is a voice you don’t argue with and you don’t forget.